“This board is SO MUCH FUN! Riding on it makes me go weeeeee! like a little kid.” This flexy, playful board was well-liked by our testers, who appreciated the board’s buttery feel and pop. The subtly scooped nose and tail made the board smoother for boxes and butters. Although it handled some freeride terrain, the soft flex makes this board best for jibs and small park features. This board is the best thing to happen to snowboarding since sliced bread. Seriously legit. It was ready to jib right out of the box, no scary break in period required. I jumped on various rails and boxes my first day on this board - no near death experiences or scary crash scenes. If you like to ride fun terrain (in the park or not) you need this board like you need a new pair of shoes! LOVE IT!! 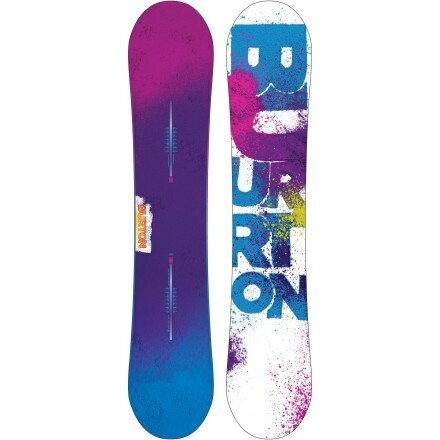 I just got this board to replace my Burton Cruzer at 50% off at the local mountains. The first day I wasn't so sure if I liked it or not. I kinda had to get used to the feeling of the V-rocker. On the second day, I found that this board is very easy to ollie, really helps when you land on small/medium jumps. It's almost impossible for you to catch the edges on it which is very good for beginners. I don't think it's very good for carving though. It feels wobbling at high speed. Over all, I do recommend this board to beginners, and park riders. Got this snowboard for my fiancÃ©e and she loves it. She's not into going super fast, so this board lets her play around in the park and butter her way around the mountain. The detuned edges are a nice feature since this board is made for jibbing around, and the sintered base is plenty quick for her needs. Definitely pair this up with EST bindings though to get the full effect! My wife demo'd this today at Hunter and she absolutely loved it (I have to find a 137 for her now!). She completely slayed the park from jib to jump. And buttered like it was nothing all over the mountain. Her only complaint was the carving was tough to engage an edge and thus made bombing black diamonds interesting to say the least. Otherwise she would definitely recommend this to anyone who sticks to the park or rides a small mountain. I'm pretty sure it rides a lot like the whammy bar that I tried out. Get one! I think for cruising and park riding, this board is fine as it is.